Evergreen shrub; stems reddish-brown, 4-ridged or smooth, branches erect or prostrate, 0.2-1.0 m tall. Opposite, oblong-lanceolate, lanceolate or oblanceolate, evergreen, 1-3 cm long, leathery, glossy, toothed, margins slightly rolled under. Inflorescence of solitary or numerous, fragrant flowers in axillary leaf clusters all along the branches; petals 4, maroon, 3-4 mm wide; sepals 4. Capsules egg-shaped, 3-4 mm long 1-2 seeded; seeds dark brown, covered by a thin, lacerate, white membrane. Mesic to dry slopes and forests in the lowland, steppe and montane zones; common in BC south of 56degreeN; E to SW AB and S to CA. 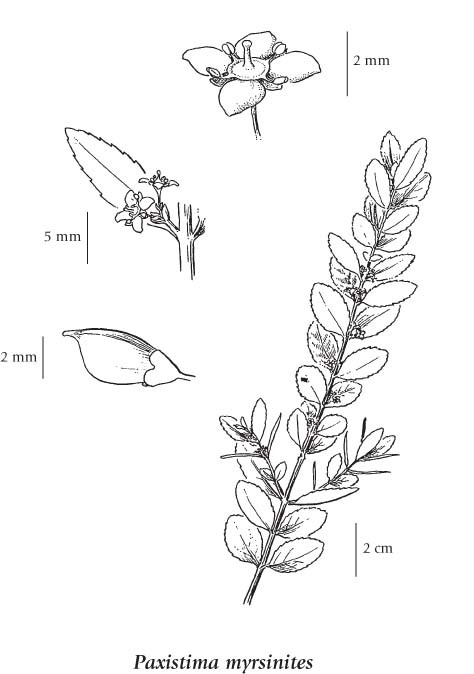 A shade-tolerant/intolerant, montane to subalpine, Western North American evergreen shrub distributed more in the Cordilleran than the Pacific region; its occurrence increases with increasing continentality. Occurs predominantly in continental boreal and cool temperate climates on moderately dry to fresh, nitrogen-poor soils. Edaphically comparable to Gaultheria shallon. Scattered to plentiful in coniferous forests on water-shedding sites in the coast-interior ecotone, sporadic in maritime climates. Persists on cutover sites; on nutrient-rich sites inhabits decaying wood. Usually associated with Hylacamium splendens and Pleurozium schreberi. An oxylophytic species characteristic of Mor humus forms.